While 2000 AD’s staple stories or ‘Thrills’ – like Judge Dredd or Strontium Dog – run into several episodes, Future Shocks are one-off, twist-in-the-tale sci-fi stories in the tradition of The Twilight Zone or The Outer Limits, and they were hosted in the early days by 2000 AD’s belligerent alien editor Tharg the Mighty. A Future Shock is the sort of narrative mousetrap designed to lure you into the furthest reaches of an idea and bite you in the behind on the last page with a twist straight out of the Roald Dahl/O Henry playbook. 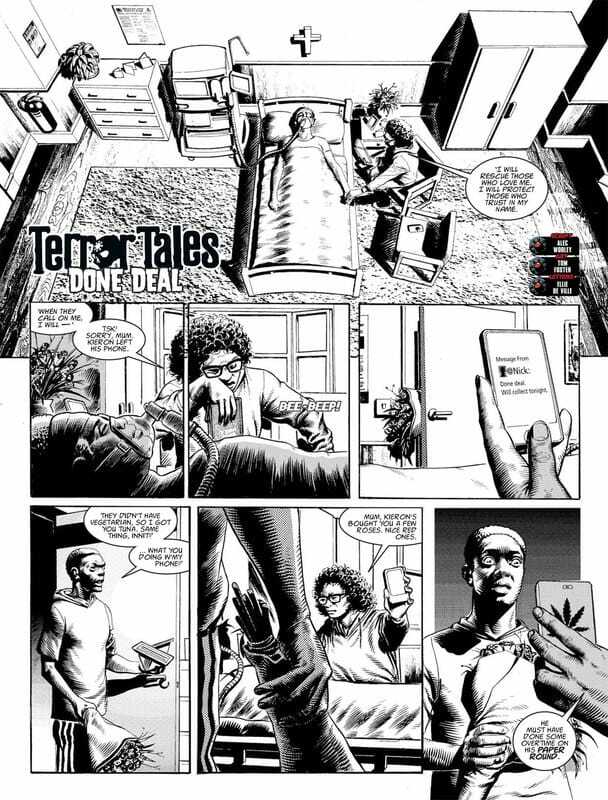 Since they first appeared in issue (or ‘Prog’) 25 of 2000 AD, Tharg’s Future Shocks soon sub-divided into genre variants like Tharg’s Terror Tales (horror), Past Imperfect (alternative histories), and Time Twisters (time travel). It’s via these routes that new writers traditionally come to work for 2000 AD and that was certainly the case with me. I spent months and months firing story after story into the slush pile, soaking up rejections like the Terminator soaked up bullets. 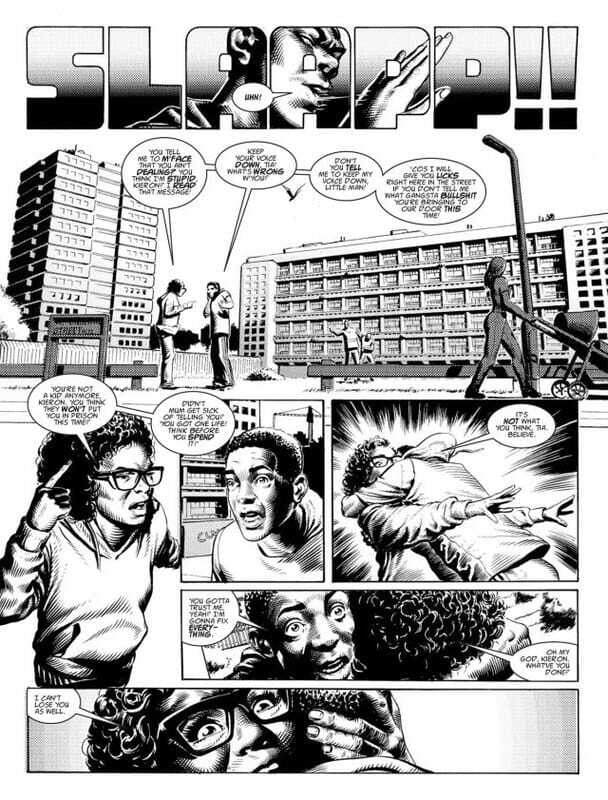 I actually blogged about this gruelling yet valuable experience: My Future Shock Hell: How I Broke Into 2000 AD (And What I Learned While Doing It). So, here’s a detailed bibliography of my published Future Shocks, Terror Tales, et al, including my entry in the three-episode series Tharg’s 3rillers. The original twist ending for this story was a lot nastier. So nasty in fact that the editor asked me to rework it. By the way, Seeing Things is based on a real-life phenomenon called ‘Pareidolia’, which means the perceiving of significant patterns, images or sounds within random stimuli (shapes in the clouds, Our Lady on a slice of toast, Satanic lyrics on Justin Bieber albums played backwards, stuff like that). If I had to pick favourites, this would definitely be one of them. Warren’s storytelling and his evocation of a mundane world infused with dread and weirdness (so vital to a ghost story) is what really carries this tale for me. (Plus, I really dig that he snuck the Lost Ark onto page three, panel three…) 2000 AD editor Matt Smith actually came up with the poignant idea of the ghosts searching for objects that would allow them to move on. My wife came up with the ending. ​Two British backpackers sneak into an abandoned theme park on the outskirts of Tokyo where a sinister presence awaits. 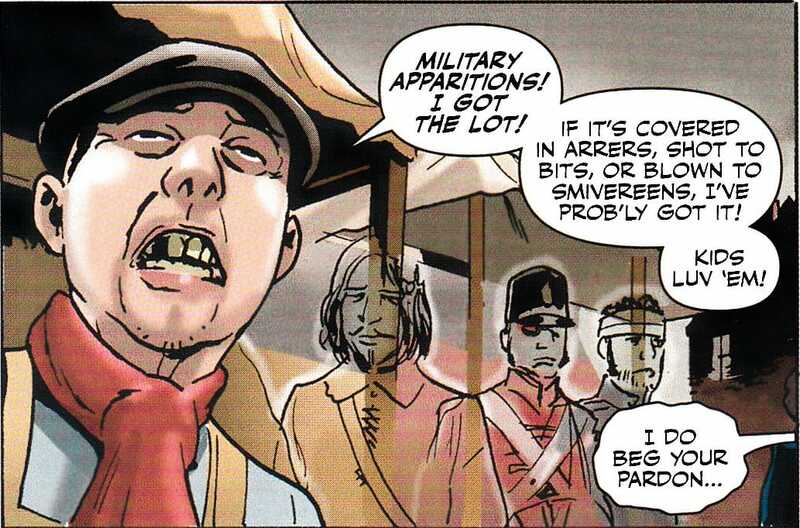 Three episodes, with art by Michael Dowling and letters by Annie Parkhouse, in 2000 AD #1743-45, July-August 2011. One-shot, with art by Warren Pleece and letters by Simon Bowland, in 2000 AD #1631, April 2009. ​When a dangerous phantom escapes the British Ghost Museum, dandy ghosthunter Doctor Spartacus Dandridge is summoned to get it back. In this alternate vision of Edwardian Britain, captured ghosts are regarded as priceless antiques; the more infamous the deceased the more valuable they become. Can Doctor Dandridge recapture the errant spectre before he causes the carnage required to increase his own value…? My second commission for 2000 AD, but my first to be published, this one waited patiently in the slush pile and underwent several major rewrites that brought it within a hair’s breadth of commission (my eternal thanks to then-submissions editor Mr David Leach). Then David moved on and the script tumbled back into the depths of the slush pile (my screams of frustration were heard across the multiverse). Once I’d done a bit more work for Tharg, I got to resubmit the script. 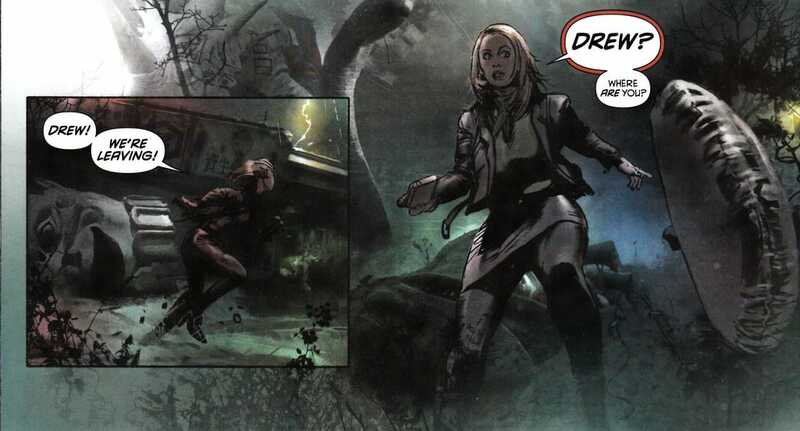 One-shot, with art by Staz Johnson and letters by Annie Parkhouse, in 2000 AD #1574, February 2008. One-shot, with art by Nick Dyer and letters by Simon Bowland, in 2000 AD #1597, July 2008. One of the artists, Anthony Williams, gleefully informed me that he based the look of Kevin D’Vaal on bestselling SF/fantasy author Dan Abnett, with whom Anthony collaborates on the 2000 AD series Sinister Dexter. One-shot, with art by Nick Dyer and letters by Ellie De Ville, in 2000 AD #1673, February 2010. One-shot, with art by Inaki Miranda, colours by Eva De La Cruz and letters by Simon Bowland, in 2000 AD #1710, November 2010.